Project Eternity Project Director Josh Sawyer offers some Q&A insights into stealth, strongholds, followers and how players won't require "prescience" to make it through the game. The wheels continue to turn on Project Eternity, Obsidian's $4 million isometric RPG that blew the doors off Kickstarter last year. In a new RPG Codex Q&A, Sawyer offered some insight into how the studio is approaching certain elements of design, including combat speed, the influence of gender and a rather unusual approach to stealth, which he described as "more involved" than the system implemented in Infinity Engine games. "Party members have a radius around them (based on their individual Stealth skills) that represents the range at which a creature's perception radius can notice them. This radius can grow larger based on the character's actions, so if you're sneaking around and you start casting a spell, it will bump up considerably," Sswyer explained. "Creatures do have two detection states (other than not detecting anything): investigation and alert. If you just 'bump' the edge of a creature's detection radius, it will typically move to investigate. If it gets close enough, it will switch over to an alert state. If the creature is already hostile toward the party, it will attack and 'call for help' (to use an Infinity Engine term), potentially alerting its nearby allies." Project Eternity will cap party sizes at six characters, but some quests may have specific NPCs who accompany the party or meet it upon arrival at its destination. 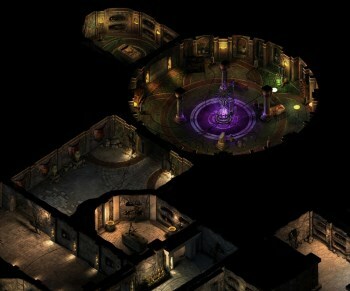 Players will also be able to employ hirelings at their stronghold who will protect it and offer other benefits but won't accompany the party on missions, and party members left behind in the stronghold will still earn a "fractional amount" of experience, even though they're not out adventuring. Sawyer also said Obsidian is trying to avoid "sucker-punches" in battles that require specific items, spells or abilities to overcome. "While there will certainly be strategic and tactical choices that will work very poorly in certain fights, we'd rather give the player a number of ways to win a battle," he said. "If we wind up creating specific formulae or one valid strategy to win a fight, I think that takes a lot away from the player's potential enjoyment." The Project Eternity Q&A covers a lot of ground and if you have any interest at all in the game, it's well worth a read. Enlighten yourself at rpgcodex.net.